I was recently looking through a pile of old advertising for photo gear. It was much stranger than you'd think. On the one hand you think of the stereotype of tech hobbies like shooting photos and home movies being the province of dad. There's no good reason for that, of course. Anyone can load film and take nice pictures. Yet if you look at some of the earliest photo ads, you see a very different image of women. Kodak actively courted women photographers in their earliest ads. They're not just shown as the subject of photography - they're out there snapping pictures, sometimes going so far as to depicted femme photogs as adventurers. Thumbing through the ads I found plenty of early Kodak ads and how-to books that prominently featured women taking photos. Even after this early start of photography being for everyone, for a long time we still ended up with this idea of photography being a guy thing. When did advertisers chose to appeal mostly to a male audience? Let's take a look at a couple of advertisers advertising their cameras by accessorizing with ladies. No real problem with the Bolex projector ad, just a glamorous lady sitting between a couple of movie projectors. No sleaziness or goony puns in the text of the ad either. Put aside the use of a woman as a sort of prop, I don't see any egregious problems here. Finally, even though the lady in our final example is fully clothed, Sabrina's jutting out over the Bell & Howell slide projector is just as bad as the Yashica ad - possibly worse. We've long since looped back around, women and men are both happily snapping off pictures - have been for years. Photography as a hobby for everyone is healthier than ever. I just find it amazingly progressive that Kodak's early ads promoted photography to both men and women. I guess it just took the rest of the industry us a few more decades to finally figure that out. 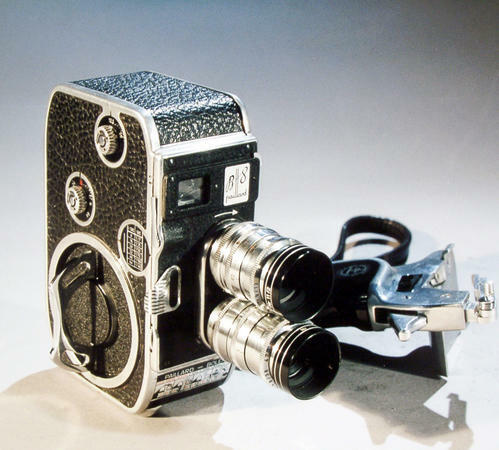 The Kameradatenbank features a fantastic collection of movie camera photos from six German library and museum collections. Twenty four different film formats are represented, ranging from Regular 8mm through massive 60 mm cine monsters. I'm sure you can take it from there. And, as always, Google Translate will do a nice job of mangling the accompanying text into almost-but-not-quite Klingon. The Last Film Movie Cameras? Digital cameras have grabbed the lion's share of the consumer market over the past decade. Now it looks like the same thing is happening in the motion picture industry, as industry giants shift production to digital equipment. Debra Kaufman of Creative COW Magazine reports, "ARRI, Panavision and Aaton have quietly ceased production of film cameras within the last year to focus exclusively on design and manufacture of digital cameras. 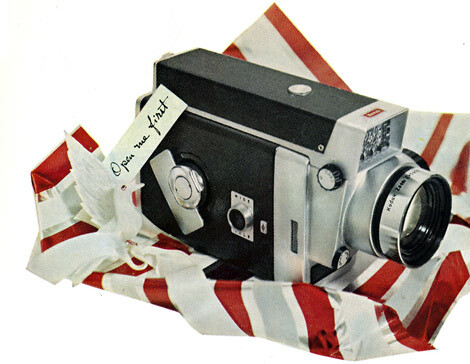 That's right: someone, somewhere in the world is now holding the last film camera ever to roll off the line." I think the reality is that there are no new film camera designs on the drawing board, but ARRI or Aaton will manufacture cameras on demand. However, I wouldn't be surprised if they had limited inventory of machined bodies and other components that don't wear out quickly. This new reality is reflected in Kodak's recent stock price woes. The once mighty film giant's share price recently dipped well below $1 on news that the company had retained the services of bankruptcy protection experts and is looking for a buyer interested in its digital imaging patent portfolio. Personally, I don't think film is dead yet and Kodak is a bargain at current prices. From slanted.de: "The first Poladarium History of Photography is a tear-off calendar just like the one in grandma's kitchen. Day by day, it reveals a new instant photo with its own short story. Year round, you'll discover tiny gems by famous photograhers as well as newcomers. The front of each of the 366 calendar sheets features a Polaroid image, while the rear presents the story behind the picture and some info about the photographer. It's an eye catching treat for the desk, window sill, kitchen counter, hall table, shop window or bedside table. Three hundred and sixty six carefully selected Polaroids, painstakingly printed with special ink and paper, presented in a beautifully designed collector's box." With Polaroids by Olaf Heine, Diana Scheunemann, Antonina Sure, Uwe Düttman and others. €24.90 each, with free shipping if you order a pair. It looks like Fujifilm is trying to carve out a stylish new market niche. The retro-styled X10 is a somewhat more practical follow-up to their X100 digital rangefinder. I was utterly stunned when Fuji rolled out the X100 earlier this year. Selling for $1200, the X100 absolutely nailed the look and feel of a vintage camera, except with a large-format digital sensor and state-of-the-art 23mm F2.0 lens. It captures fantastic images, but the fixed focal length lens and high price were turn-offs for many. Enter the X10. This high-end 12MP point-and-shoot features a respectable 2/3" EXR CMOS sensor coupled with a fast 28-112 mm lens capable of F2.0 (wide) to F2.8 (telephoto) at full aperture. Unlike many modern cameras, it includes an optical viewfinder with diopter adjustment. The lens features manual zoom adjustment but there's no manual focus ring. That shouldn't be much of a restriction, thanks to the camera's advanced 49-point high-precision auto focusing. More importantly, the shutter lag is a mere 0.01 seconds so you won't miss action shots. Accessories will include a retro leather case, precision milled metal lens hood and TTL flash. The X10 is slated to ship in October 2011 with an estimated price of around $700. Bylo wrote recently to let us know about a poor man's LOMO camera sold by Hong Kong gadget emporium Deal Extreme.This fully functional 35mm camera kit boasts 99% ABS plastic construction, right down to the optics. The only metal parts are a handful of screws, springs and a jeweler's screwdriver to put everything together. The box Includes instructions in Chinese and English (more the former, I suspect) and ships free from Hong Kong for only $12.70. A somewhat gaudier black + white + blue version is available for five bucks more, and they also offer an intriguing stereoscopic pinhole camera kit for under $20. The company sells an amazing array of gadgetry ranging from somewhat sensible things like batteries and electronic parts to kooky stuff like Neodymium magnetic spheres and magic supplies. Shipping is always free, although you'll have to wait a few weeks for packages to reach North America or Europe by air mail.